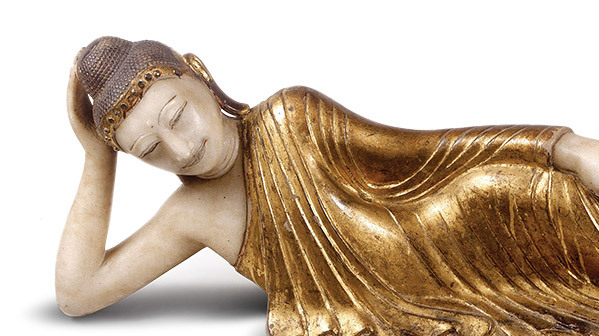 This seraphically beautiful Buddha, now in the National Museum in Dublin, is a piece of imperial loot. In the Mandalay style, which dates it to 1857–86, the statue is of marble, with the drapery painted gold. It represents the dying but beatific Buddha, preparing for his death and ascent into Nirvana. Colonel Sir Charles Fitzgerald, an Irishman in the British army in India, stole it while on a punitive military expedition to Burma in 1885–6. In 1891, Fitzgerald sent it, along with other looted Burmese statues, to the National Museum. Breathing with his hand on his nose like that Indian god he took me to show one wet Sunday in the museum in Kildare Street all yellow in a pinafore, lying on his side on his hand with his ten toes sticking out. Other imperial objects ended up in Ireland. In 1904 the museum purchased for £100, 41 metalwork objects from Lhasa, brought back from the British invasion of Tibet. (The Treaty of Lhasa, opening up Tibet to British trade, was drawn up by an Irishman, Captain Frederick O’Connor, the leading linguist on the Francis Younghusband expedition to Tibet, 1903–04.) They are reminders that Ireland was not only a victim of British imperialism. Very large numbers of Irish people participated in the expansion and maintenance of the empire, most as foot soldiers, but many as high-ranking military and civil administrators, missionaries, doctors and other professionals. In one of the great literary expressions of the imperial spirit, Rudyard Kipling’s Kim, the wildchild hero explains that his name is Kim Rishti ke. What, he is asked, is Rishti? ‘Eye-rishti—that was the regiment—my father’s’. ‘Irish, oh I see’. The ‘rishti’ were indeed common enough to get their own word in the Hindi language. Key figures in the extension and maintenance of British rule in India included Laurence Sullivan from Cork, George Macartney from Antrim (who was also the British envoy who tried, and failed, to open up imperial trade with China), John Nicholson from Dublin, and Sir Michael O’Dwyer, from a Catholic family in Tipperary, who led the suppression of protest in the Punjab between 1913 and 1920. O’Dwyer’s religion was not typical but neither was it entirely unusual: by the late-nineteenth century, 30 per cent of Irish recruits to the Indian civil service were Catholic. Irish involvement in the empire reached its height with the Boer War in South Africa between 1899 and 1902. A few hundred Irish nationalists fought for the Boers, and leading militants at home—including W.B. Yeats, Maud Gonne, James Connolly and Arthur Griffith campaigned in their favour. Nevertheless, 28,000 Irishmen fought for the British in South Africa. Anti-imperialism was becoming more vigorous, but it was still a minority position.